It’s an unusual Week Three Mid-American Conference opener for the Bulls. UB hasn’t played a conference game this early since 2012. Not only is it an important conference game, it’s a battle of undefeated teams both coming off big wins. Credit to Bulls radio analyst Scott Wilson for the fact that UB & EMU are the only MAC teams with wins over FBS opponents. Beyond this season, it’s great to see these two programs undefeated and playing in a huge early season game. 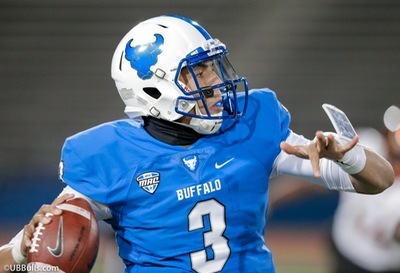 It’s been a long road to the top of the MAC for both Buffalo and Eastern Michigan. It’s great for the players, coaches and fans of these two programs to be able to hold their heads high, and raise their voices high. That should make it even more special on Saturday night. Bull Session Trivia: UB’s Lance Leipold and EMU’s Chris Creighton will be on opposite sidelines for the first time in the Bulls-Eagles series. But the two have coached against each other before. Do you know what schools they were coaching when they matched up 11 years ago? It was a balanced offensive attack for the Bulls against Temple. They ran and threw equally well, and a lot of different players touched the ball. That’s exactly how the coaching staff wants it, and Tyree Jackson is the right QB to execute that plan. He threw touchdown passes to three different players, and eight different players caught passes. Even four running backs got carries…In two games, we’ve seen the depth that is being built. The best example of that is Kevin Marks. He was the fourth running back to get a carry, and he winds up running for the most yards by a UB freshman RB since Devon Campbell in 2012…Charlie Jones may soon set the UB freshman receiving record. He is forcing the coaches to get him on the field. His touchdown was a tough, turning, twisting catch. His 18-yard grab three plays before Johnson’s winning touchdown was crucial in keeping the drive alive…While it’s noticeable when Johnson isn’t on the field, players like Antonio Nunn, George Rushing and Jones allow the offense to still function at a high level…But man, is Johnson special. His touchdown reminded me of the plays that NFL stars like A.J. Green and Julio Jones make to help their teams win. Soon enough, we may have to add AJ’s name to that list of NFL superstars…Jackson’s nine TD passes in the first two games are the most ever by a Bulls QB. Going back to last year, Jackson’s thrown 18 TD in the last five games… Jackson has not been sacked this season, making the Bulls one of 12 teams in the nation to not allow a sack in the first two games. The offensive line is playing great…But they will get a big test Saturday. The strength of Eastern Michigan’s defense is their ends. Maxx Crosby was first team All-MAC last year after totaling 11 sacks. Jeremiah Harris had six sacks, good for second team All-MAC. Crosby usually lines up on the offense’s right, which means he’ll be matched up with Bulls RT Kayode Awosika. That’s a matchup to watch in this game…Last year, the Eagles were #2 in the MAC in total defense and scoring defense. Bulls coaches have noticed. As they spent time during the offseason getting ready for their early opponents, the constant observation you heard was “Eastern’s defense is one of the best we’ll face all year.”…At linebacker, Kyle Rachwal has a great name and a game to match. He’s a classic tough and smart middle linebacker. He had 11 tackles against Purdue…Safety Brody Hoying was also first team All-MAC last year. But he was hurt and missed the Purdue game. His status bears watching…The Eagles use an extra safety in the box, and that player, Ikie Calderon, is their third leading tackle. Strong safety Vince Calhoun is number two on their tackle list…Weather conditions played a role. But Purdue did run for 341 yards last week, and averaged 8.1 yards per carry. The Boilermakers had three runs of 30+ yards. Bullet Points: 30. That’s the milestone touchdown pass that Tyree Jackson reached on the game winning TD to Anthony Johnson. That puts him 7th on UB’s all-time list, and just three scoring throws from moving into the top five. Remember, Temple scored one touchdown on a halftime Hail Mary and another on a blocked punt. So the Owls didn’t exactly rack up the yards on the Bulls defense. The Bulls forced four three-and-out possessions. That’s my way of saying this UB defense is much improved from last year. The pass rush, led by Chuck Harris, is greatly improved and doesn’t always need blitzing to get to the QB. The run defense, with improved play from the defensive tackle group, is holding opponents under four yards per carry. The pass defense is giving up less than 160 in each of the first two games. But most importantly, they are forcing turnovers. It’s now up to seven, which is half of last season’s total…Harris is emerging as one of the MAC’s best defensive ends. Aside from his game-clinching sack, he is demanding double teams regularly and now has four sacks in his last five games…Ledarius Mack has been a pleasant addition to the third down defense. He’s constantly around the QB, and he’s made impact plays in each game…Khalil Hodge was back in double-digit tackle territory against Temple, with ten. He now has 295 tackles in his 26 games, and should hit the 300 milestone by halftime…Cam Lewis is now up to four career interceptions with the two he had in Philadelphia. He has a knack for making important, game-changing plays…Young players like Tyrone Hill, Eddie Wilson, Tim Terry and Malcolm Koonce are all starting to emerge as playmakers…Eastern Michigan has done a good job replacing their all-time leading passer, Brogan Roback. Tyler Wiegers played four years at Iowa, but only threw six passes. The Detroit native decided to come home for his senior year, and he’s been great. Running the Eagles quick passing offense, he’s completing 77.6% of his passes, good for 4th in the NCAA. Lance Leipold is impressed, and says Wiegers experience and maturity is evident in how he runs the offense…EMU lost six of their top eight receivers from last year, but a new group has emerged. Converted running back Blake Banham leads the team with 14 catches. JUCO transfer Arthur Jackson is averaging almost 18 yards a catch. Matthew Sexton has two scores, including a big 75-yard TD vs. Purdue…The Eagles haven’t run the ball well (3.4 yards per carry), but they have a stable of solid backs. Ian Eriksen, Shaq Vann and Breck Turner will all see some time…Against Purdue, in a driving rain, the Eagles totaled 462 yards and 302 yards passing. Despite Mark’s breakout performance against Temple, Coach Leipold continues to say that the position will be a committee. Emmanuel Reed, Johnathan Hawkins, Jaret Patterson & Theo Anderson have all carried the ball this season, with Reed starting both games. “We’re very confident of all our running backs. We’ll see times this season that a game will play out for one of the guy’s skill set, allowing him to flourish more than the others,” says Leipold. So while Marks had his star moment in Philly, he may not get the most carries against Eastern Michigan. So just like me, you’ll always have to check to see which runner is in the game. By the way, how much does Marks look like and run like UB great James Starks? Both are tall, upright runners with good speed. That’s a comparison Marks should be proud of. Bull Session Trivia Answer: In 2007, in the Division III playoffs, Leipold’s Wisconsin-Whitewater Warhawks beat Creighton’s Wabash Little Giants 49-7. That was on the way to Leipold’s first of six National Championships. Please join me, color analyst Scott Wilson, game host Brad Riter and postgame host Bob Gaughan for the broadcast on the Bulls Football Network. Our pregame show starts at 5:00pm. You can hear it in Buffalo on ESPN 1520 and in Rochester on Fox Sports 1280. A link to the online broadcast is also available here and on the Tune In app.